One of my favorite soups to have when it's cold outside is this easy onion mushroom soup. Just 4 ingredients to a comforting appetizer! 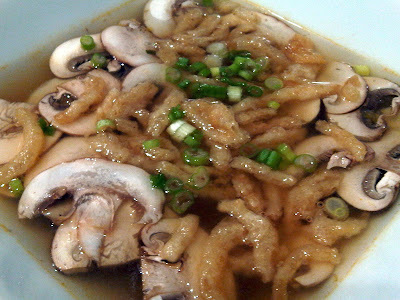 Heat up chicken broth and spoon in a bowl, sprinkle sliced mushrooms, fried onions, and green onions on top! Enjoy. I did not list the quantity of each ingredient because you put as much of each item as you like. You can put a little mushrooms or a lot of mushrooms -- or none if you don't like mushrooms but then this wouldn't be French Onion Mushroom Soup ;-P. John doesn't like raw mushrooms but since they are sliced really thin, the heat from the broth tempers the mushrooms a bit. I like to use fresh mushrooms because the taste and crispier texture is slightly different from cooked ones. If you really want to be naughty, sprinkle shredded mozzarella cheese on top. Yum-yum!! Thanks for sharing Daly:) It sounds like my new go to soup. Simple but delish.